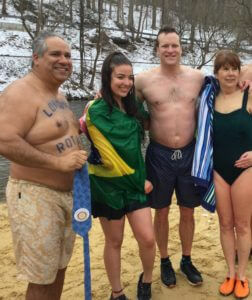 The water temperature was a near-freezing 39 degrees when hundreds took the 2017 Polar Plunge in support of the Brandywine Red Clay Alliance in West Chester Pennsylvania. Among the plungers were several members of the Longwood Rotary Club including President Tim Rayne. 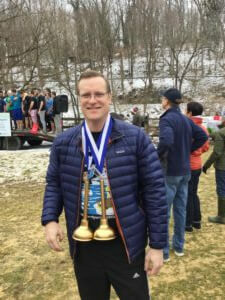 Before the Plunge, the Longwood Rotary was honored with two Golden Plunger Awards, one for team participation and the other for raising over $1,000 to support the conservation mission of the Brandywine Red Clay Alliance. Other Longwood Rotarians participating in the event included President Elect Lenny Rivera, Brazilian Exchange Student Fernanda Teles and After the Bell Executive Director Kathy Do. Fellow Longwood Rotarian Editor Fran Maye covered the Polar Plunge for The Kennett Paper.